Greetings and salutations friends! Happy Friday! 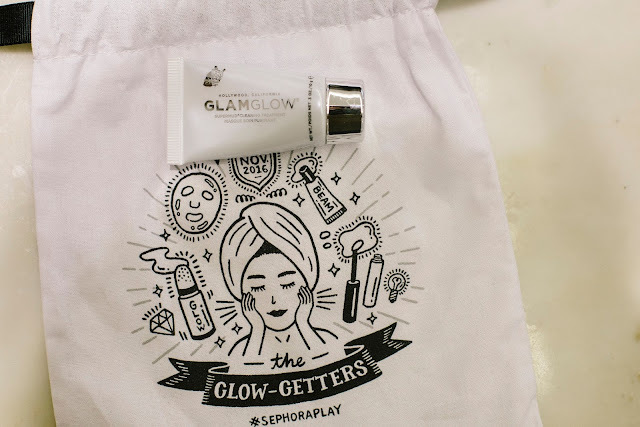 I finally got a moment to review my November Sephora Play box. 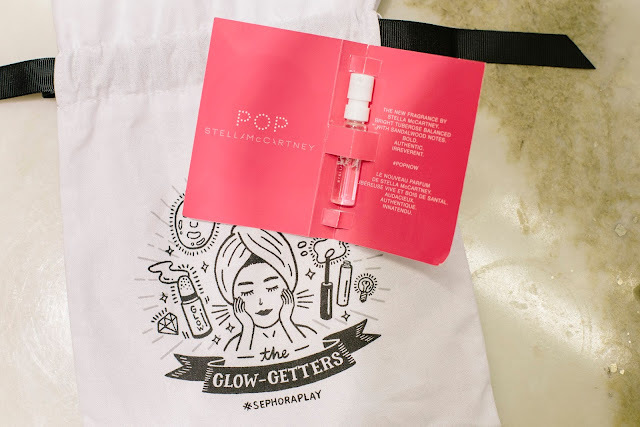 This month's box was fun focusing on giving yourself a glow and having a retail value of around $45! 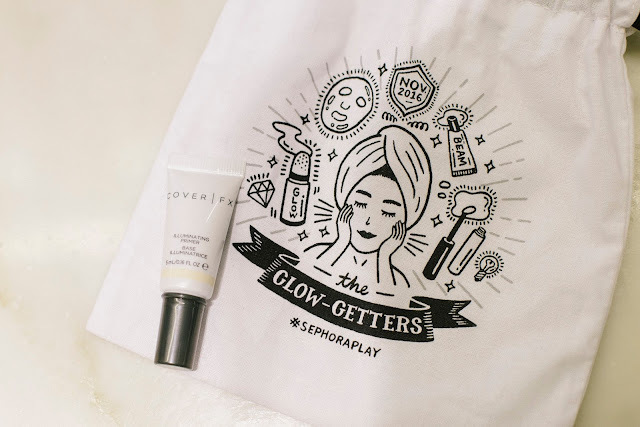 I know I say this every month, but this was my favorite Sephora Play bag thus far for sure. The face mask girl is just too cute. 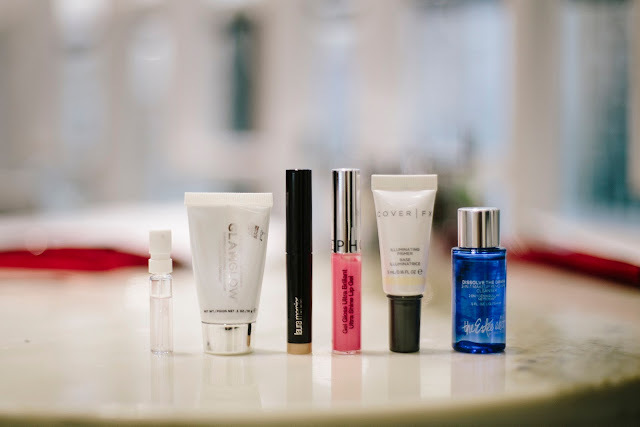 Two new brands I got to try this month were Cover FX and Stella McCartney. This past week of school has been killer. Group projects, papers, more projects, presentations, work, and the list goes on. Oh and finals! Thankfully I'm going out with my friend Mallory tonight for Thai. This is a modern fragrance with a woody scent. The fragrance consists of tomato leaves, violet leaves, green mandarin, plumeria, sandwalwood, cedarwood, and musks. I was nervous that it'd be too floral but it wasn't at all. There is a very soft woodsy scent but I surprisingly like it. It reminds me of my childhood for some reason? I think the shower gel and body lotion would be a nice treat for Xmas! I don't diversify my eyeshadow collection anymore so I always have an open heart with eyeshadows from Sephora Play. When I saw a shimmer eyeshadow stick I instantly was hesitant. Hello Kitty charmmy eyeshadow sticks from Sephora were my go to in high school. They worked well enough (birthday cake being a favorite color) but I feel like I got monotonous with eye shadow sticks. I was amazed at how pretty this eye color is. 99% of the time I do a matte eye look, but sometimes I want some sparkle without the drama. This is the eyeshadow for it. I think it adds a nice, somewhat dramatic sparkle, without being too much. I certainly would not go out and buy one of these sticks, but the addition is a nice surprise. There is also a gift set for these eye sticks, check it out here! I hate getting lip gloss in Sephora Play. I never use them, they just take up space for one day when I do decide I might want gloss. Although this is a nicer lip gloss it has decent pigmentation, and not too sticky. However, I would never ever pick it up. It lasts for about an hour on me, and smells strangely. I did like the applicator though. Personally I think Buxom's Full-On Lip Polish is a better alternative to this lip gel even though its stickier. 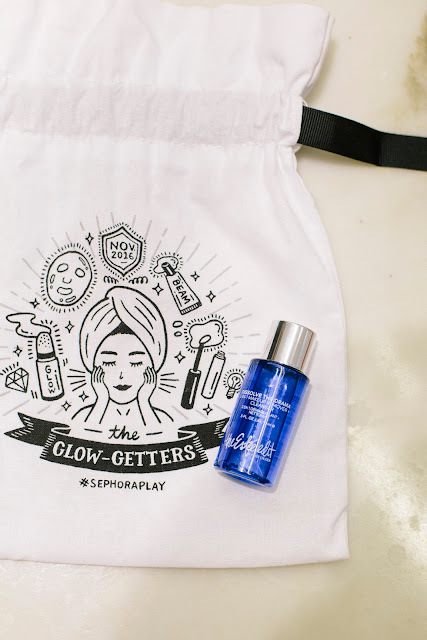 This primer is a silicon-free primer and it helps illuminate dull skin. I'm not a big primer girl but I LOVE THIS PRIMER. I've never seen a primer illuminate face and my normal skin like this one. The formula is a bit thin but that doesn't bother me much. The price is kind of a bummer $38 for 1 oz. but I'll definitely get another sample off eBay. When I get cheap I go to Sephora to get minis of Dissolve the Drama makeup remover with my Beauty Insider points (I'm saving my points to meet KVD someday, lol). I've gotten 2 now when I didn't want to go buy makeup wipes. This cleanser works well enough but I would say it dissolves eye makeup much better than face makeup. I don't like makeup remover because its crazy oily, and this product isn't any different. Having normal skin I didn't feel like it made me break out but the oiliness is just too much. I would never use this product alone as 2 in 1. Unless you use a significant amount this product is not enough to take off everything, you still have to wash your face afterwards. My hands are always oily as hell after using what seems like the smallest amount possible. Kinda a bummer but not a bad product to get when I'm running low on makeup wipes and feeling cheap! Overall this box was a nice treat. 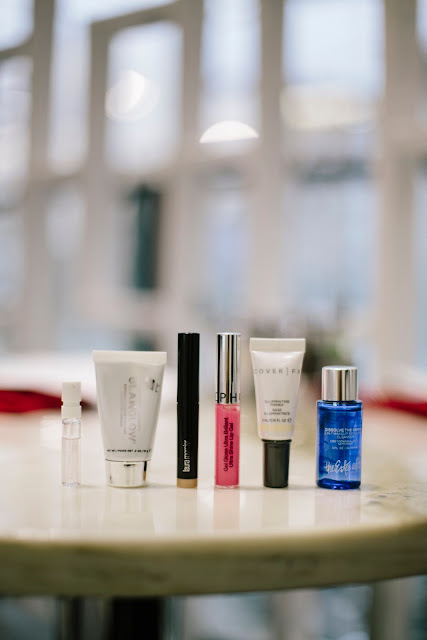 I loved the Stella McCartney perfume and the Cover FX primer. The caviar stick and GLAMGLOW Supermud were nice additions to my beauty collection. 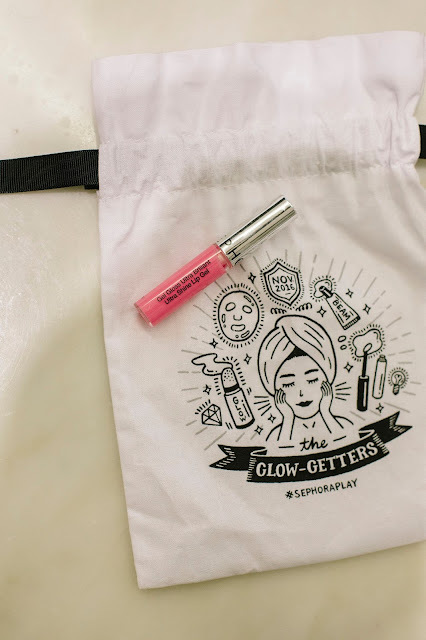 I hated the Sephora lip gel, but we'll get them next time with ABH instead (I pray). In the mean time happy holidays everyone! I hope you get some nice relaxing time with your family. I will probably not post until after New Years, but I'll be on Instagram! I'm considering redoing the site with a new layout that's slightly more interactive Its been many moons since I've updated the sites look. Thoughts? Fabulous post really enjoyed reading and I thought your pictures were awesome!!! This is actually a decent selection of products! I have that CoverFX primer, it's okay but I prefer Becca Backlight Primer Filter. It was Shireen. I feel the opposite way. For me Becca Backlight doesn't do as much, but I still like it! These look like great goodies! I always love trying new products! Me too Jamie! Thanks for stopping by! I'll have to try out that LM shadow. I'm a matte eye look girl as well, but I can't resist a good rose gold. Gonna check out the Stella McCartney perfume next time I'm in Sephora too! Thanks for the reviews! Thanks for stopping by Jessica. You should Stella McCartney seems very you. Def check out the LM eyeshadows, would recommend! You should try them! Thanks for stopping by! Their sample packaging is so better than their full size packaging Katherine! I would recommend samples off eBay. These products seem pretty amazing! I'd love to try the primer specifically because I have uneven skin tone, which can look quite dull, so this seems like it'll help create a nice subtle glow under makeup! Thanks for sharing your thoughts with us, girlie, and I hope you have a great week ahead! I think this product might work for you Jalisa. 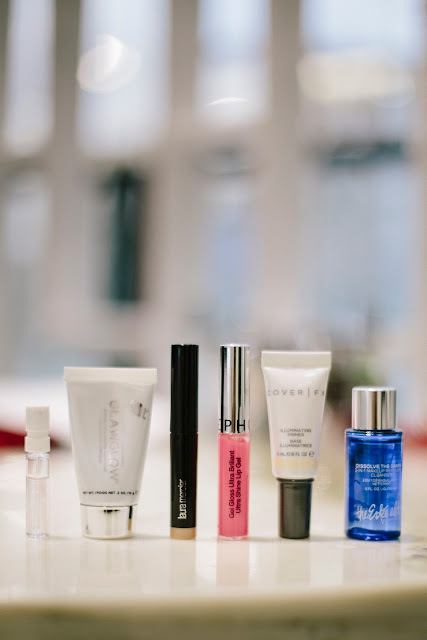 You should try a sample next time you visit Sephora! Thanks for visiting, likewise! Can you believe I still haven't tried the GlamGlow masks? I need to already, right haha? And that sparkle stick is probably a better bet for me seeing as I go crazy with shimmer. I need something to rein me in with the eyes. 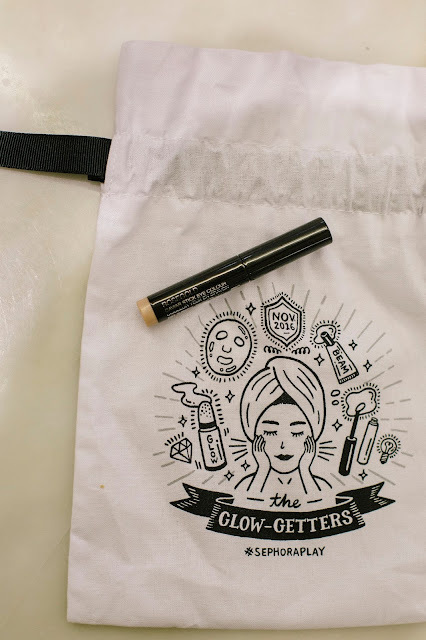 And I'm loving the idea of that illuminating primer. A better bet than adding illuminator later as I always feel like I never blend it in properly. And then I have these weird glow streaks on my face haha. Wow I am so surprised you've never tried them! Yes! I really like the shimmer stick even as an all matte girl. Just enough sparkle. Haha I understand it happens! I love that eye shadow stick- what a pretty color! So great! Thanks for stopping by Ashley! omg all the products sounded so good a bit of a shame that thesteeedit remover dint work as well! i so want that sparkle stick! You should try it! I'm not a makeup remover person at all haha. Just doesn't work for me. i want to try their mixed bags! it sounds so amazing! You should sign up, I think they let spots open every month! It's so great! Such a fun addition to my makeup collection. What a beautiful make-up set. They look impressive. Thanks for stopping by Ashon! I definitely think this was a good one!! Loved the post you shared and the products as well. 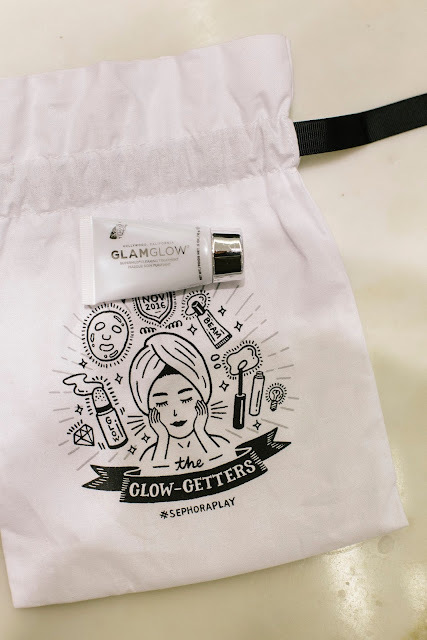 Well that GLAMGLOW SUPERMUD Clearing Treatment sounds interesting! 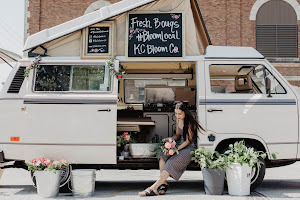 You should check it out Jeanne thanks for visiting! thank you for the review Chanel! this is very useful! Anytime Liz thanks for stopping by! Thanks for visiting Vivian! I'm wearing it now, its wonderful! Thanks for visiting Eva, happy holidays! I hope you're enjoying your Christmas break Sonia!! I always love your beauty reviews. That eyeshadow stick looks great and I'd love to try the primer. I'm not much of a primer person (an extra step? no thanks!) but I think I would wear it if it really did make a difference. Thanks Mme I am! I like it but its sorta an extra step. 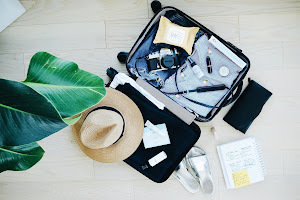 such amazing products- great post!